We understand that these days you require more from the firm you choose to fit your rubber roofing in Leicester. Therefore we’ll take care to properly examine the job and then give you a free estimate. Once you set us to work installing your rubber roof, we’ll do everything we can to be unobtrusive and courteous throughout. Give us a call and hear about our superb service: 0116 316 9544. We’re a local firm that’s been working across the Midlands for many years. 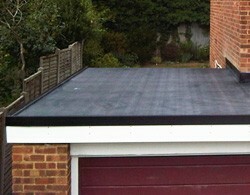 Trust us to install your rubber roof and you’ll be delighted with the results provided by this exceptional material.